For propene the calculation again predicts no lone pairs on the central carbon. Here the VSEPR treatment is seen for a double bond, and note the VSEPR method works for organic species just as well as it does for inorganic molecules. The π electrons in the double bond cause that vertex to appear a little bigger than a simple σ bond and so to make room, the Me-C=CH2 bond angle (124.8°) is a little greater than the ideal angle of 120°. 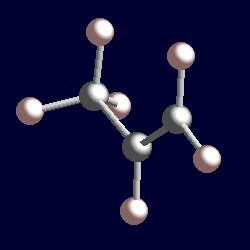 The geometry of propene, MeCH=CH2. You can use your mouse to manipulate the molecule in the right hand "Jmol" image.